Businesses are increasingly looking at cloud-based solutions to support the multitude of operations they perform on any given day. A recent study by Forrester identified that more than 50% of global enterprises will rely on at least one public cloud platform to facilitate their digital transformation and customer experience/interaction enhancements. While the topic of moving into the cloud warrants its own dedicated post, it’s important to highlight that the main reasons why businesses are stepping into the cloud are speed, convenience, and accessibility. The same is true for businesses that leverage SAS software solutions, which is why SAS Hosting Services, provided directly by SAS or by one of its reputed partners, are becoming increasingly popular. To understand why SAS Hosting Services are being sought out, we need to look at how leveraging such services empower businesses and organisations with greater synchronisation. As founding members of the SAS Cloud Innovation Council, Selerity comprises a team of thought leaders and initiators of best practices – capable of catering to businesses and organisations from a wide variety of industries and segments. By leveraging SAS technology and the vast experience of our team, we have successfully provided our clients with powerful and insightful solutions that optimise their SAS in the cloud. In addition to boasting many years of experience in SAS, our team also has tremendous expertise in AWS environments, which facilitates a more streamlined cloud hosting services. Following SAS’ announcement at the analytics giant’s annual global forum last year (2017) that introduced its latest cloud environment, SAS Viya, organisations across the world have already started leveraging the platform and its many benefits. Here at Selerity, our SAS hosting services cater to, both, customers in need of the latest SAS Viya environment and those who are in need of SAS 9.4 Hosting. This diversity in our service portfolio allows us to cater to a wide array of clients with varying requirements. What are the core benefits of Selerity’s SAS hosting services? The most obvious benefit of our services is diversity in service offerings. We work closely with Amazon Web Services and, together, have successfully deployed SAS Hosting environments in a plethora of reputed organisations like the University of Melbourne’s Melbourne Business School. In this particular instance, our team worked closely with the university to architect, provision, and manage their analytics platform – delivering an extremely cost-effective and leading analytics platform capable of being scaled accordingly to meet the requirements of the program. This flexibility and scalability can be replicated and applied to any organisation belonging to any industry. In addition to the diversity of services, another key benefit of our SAS hosting services is that we leverage the latest cloud-hosting technologies – leveraged by both SAS and our collaboration with AWS – which guarantees our clients the most optimal levels of speed, agility, and savings. 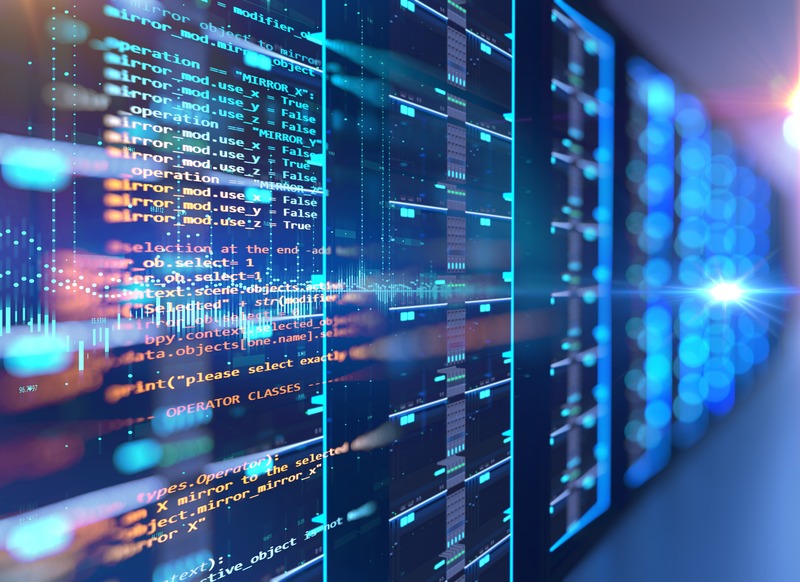 It’s also important to keep in mind that by leveraging SAS’ cloud-hosting environment, organisations would not need to give up any of their existing systems or use them in a silo. Our SAS hosting services allow our clients the option of combining their SAS cloud-hosted environment with any one of their internal systems – allowing them to draw key analytics-based insights from these systems as well. These integrative systems could include either on-premise systems or cloud-based Active Directory and other databases. 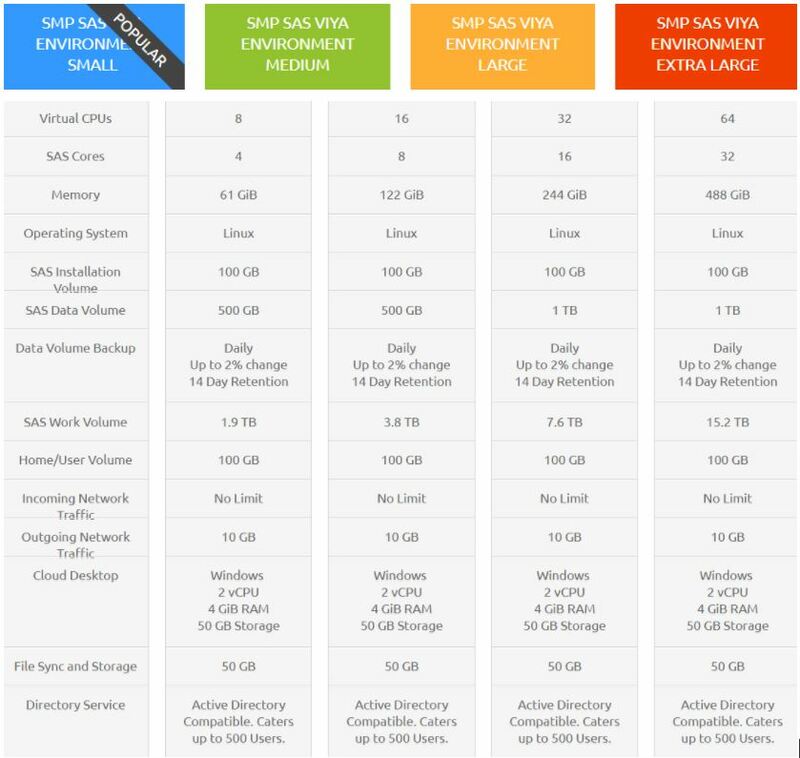 What’s the difference between SAS 9.4 and SAS Viya? If you are new to the world of SAS hosting services, chances are this is a question you have – and it’s an important one to understand. SAS 9 and SAS Viya are two very unique platforms that were built for different uses. That being said, both platforms do share some overlapping functionality – for example, both leverage the SAS programming language, with SAS Viya using the next generation of SAS programming along with the new and closely aligned CAS programming language. In terms of differences, SAS Viya contains new procedures that leverage an open and distributed environment, which results in certain SAS 9 procedures not being accessible within a new SAS Viya environment. Other notable differences between SAS 9.4 and Viya include the fact that there is no concept of roles or capabilities in SAS Viya, given that access to various functions is managed by rules that target either a service, a service endpoint, a media type, or a pseudo URL. Additionally, instead of relying on metadata-based authorization, SAS Viya manages authorization within the CAS engine and by using host identities. Yet another big difference is that In SAS Viya, images can be submitted and are a recognizable data type. 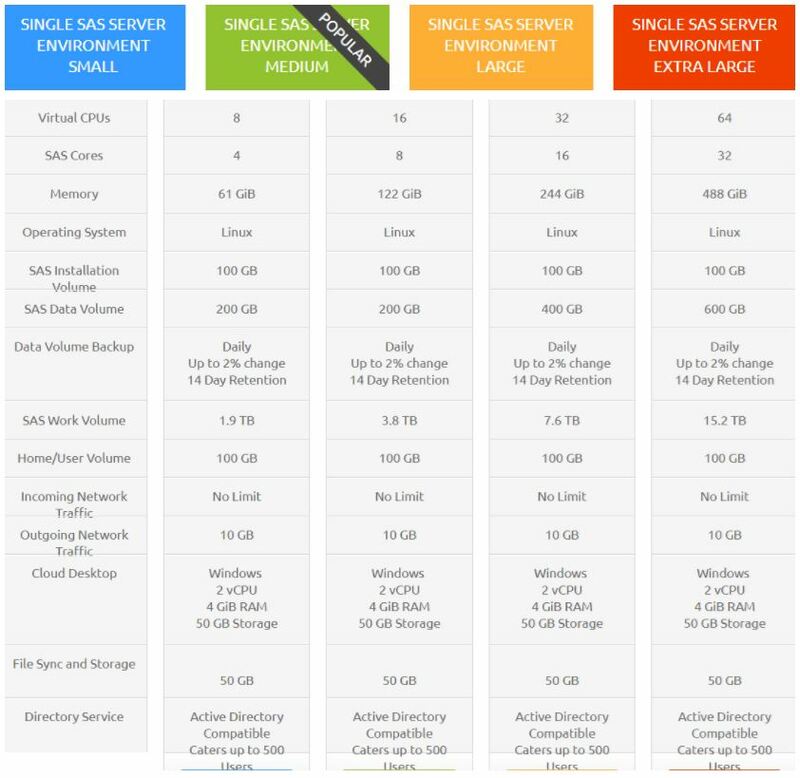 Having run through a few of the core differences between SAS 9.4 and SAS Viya, the following illustrations comprehensively illustrate the breadth of our SAS hosting services – for both SAS 9.4 hosting and SAS Viya hosting. Adhering to our commitment of catering to organisations of all types and sizes, our SAS hosting services are categorised in terms of Small, Medium, Large, and Extra Large environments – depending on a particular organisation’s requirements. The major difference in our service offering is that the SAS Viya option includes a higher SAS Data Volume amount – starting off at 500 GB and a maximum of 1 TB, as opposed to SAS 9.4, which comprises a minimum data volume of 200 GB and maximum of 600 GB. Get in touch with us if you have questions about our SAS hosting services! Having operated in the analytics space as a SAS Silver partner for a decade and by leveraging the countless years of shared SAS experience among our team members, we have strengthened our position as a leading SAS hosting services provider both here in Australia and around the world. Through our services, we have helped many of our clients experience significant savings – in certain instances ranging in the millions of dollars. If you would like to know more about our SAS hosting services – both 9.4 and Viya hosting – our company and our work with SAS, in addition to how you can leverage our other SAS installation and administration services, feel free to reach out to us, or stay tuned to this feed.